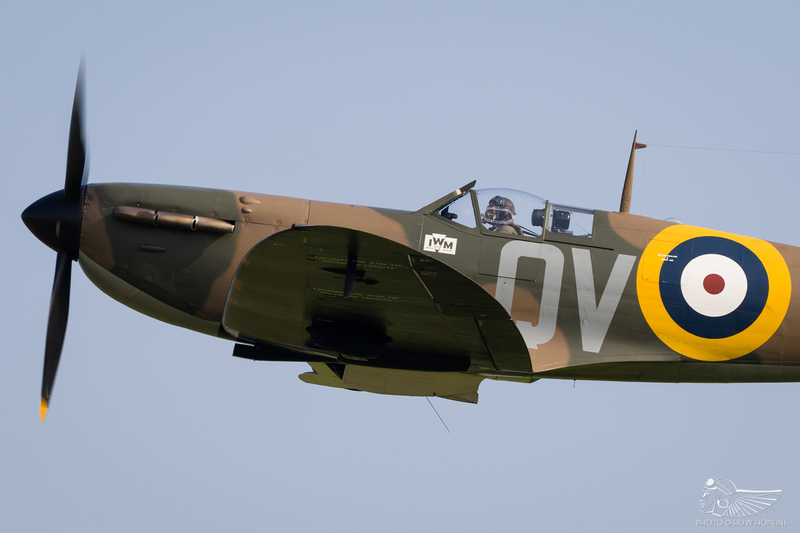 In 2017 we saw the re-branding of IWM Duxford’s two remaining airshows – May’s Air Festival, geared firmly towards the family demographic, and September’s warbird-heavy Battle of Britain Air Show, with a strong emphasis on Spitfires and other heavier vintage aeroplanes. This effectively cast aside the themed airshows of old in favour of more formulaic events. The 2017 Air Festival was accordingly something of a major departure from the usual Duxford fare, neglecting the many based vintage aeroplanes in favour of a family friendly generalist approach. There were high points, certainly, but whilst the event was well-received it lacked the spark that can make Duxford airshows so special. 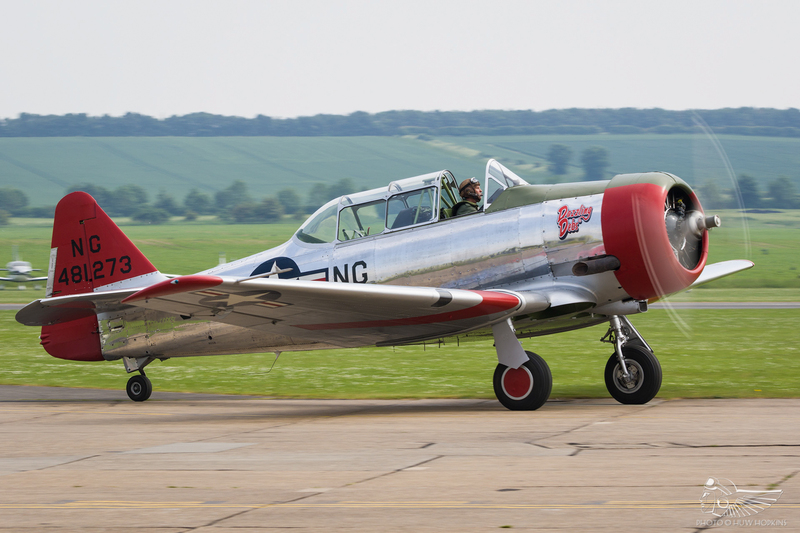 Things certainly looked more positive as the 2018 Air Festival’s line-up developed in the weeks preceding the event, with more warbirds and vintage aircraft than at the first edition. The rest of the participants largely remained the same or similar to those featured in 2017. With no classic jets on the bill this year, warbirds effectively took their place on the programme – with no disrespect intended to their operators, the post-Shoreham airshow restrictions have blunted the dynamism of classic jet displays with some still precluded from carrying out aerobatics over land, and warbird displays arguably offer a more engaging and dynamic alternative. Less positive in the run up to the airshow was the corporate advertising the IWM seems to expand on each year. 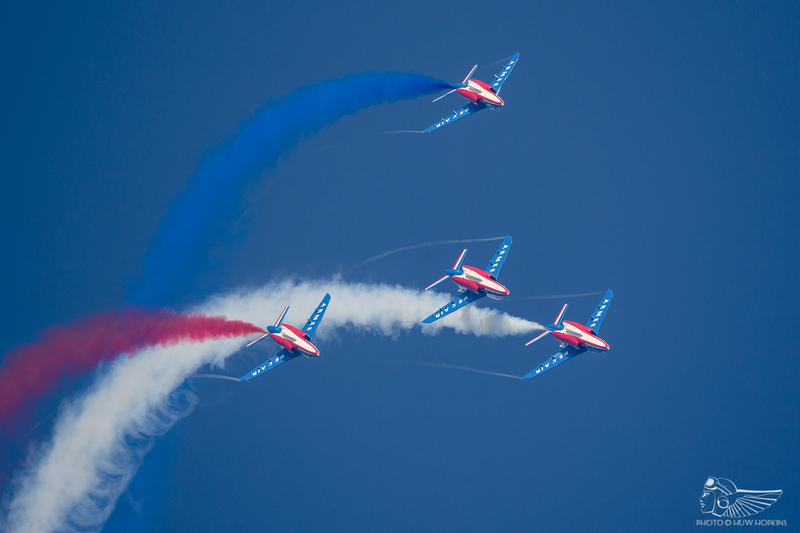 We heard more about the ‘Air Festival playlist’ to get us in the mood to ‘feel the power’ than we did of actual aircraft participation – a cringe worthy approach to promotion from a longstanding, respected airshow venue. It’s clear all this marketing is aimed towards the family demographic, which the event seems to attract with some success. The empty feel of the showground spoke volumes at the 2018 Air Festival; at the eastern end of the airfield there were gaps all along the fence line, so few people were around (particularly compared to the heaving crowds at the Battle of Britain Air Show 2017 and Flying Legends). It will be interesting to see if that pattern repeats itself in successive years. Perhaps the Air Festival just needs time to mature and will attract stronger numbers from the key demographic over time. One issue that needs addressing is the adequacy of food vendors in the showground; noticeably stripped back from any previous Duxford airshows, with large queues at each which stretched their staff to capacity. It stands to reason that if you cut the number of food outlets, the pressure on staff increases exponentially and the net result was that customers queued for long periods only to find that soft drinks had not been chilled properly and both hot and cold food was rapidly selling out – on such a hot weekend, that was a big issue and it certainly needs rectifying at future IWM organised events. The flying programme itself was an improvement on the inaugural Air Festival in 2017, with more of the rare historic aircraft that are synonymous with Duxford and several high points courtesy of UK debuts and foreign participants. 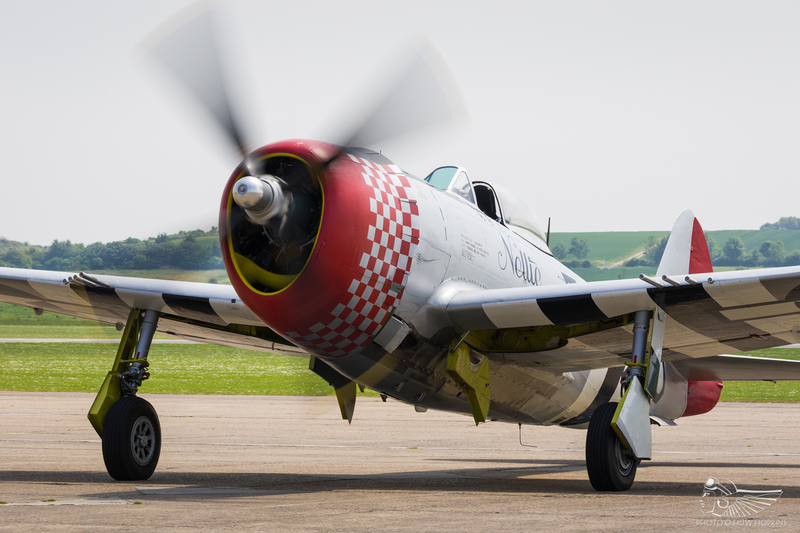 The return of P-47D Thunderbolt G-THUN to the UK display circuit has been warmly and widely welcomed; the aircraft was famously operated for decades by The Fighter Collection (TFC) as No Guts – No Glory! and was a tremendously popular airshow act throughout that period. 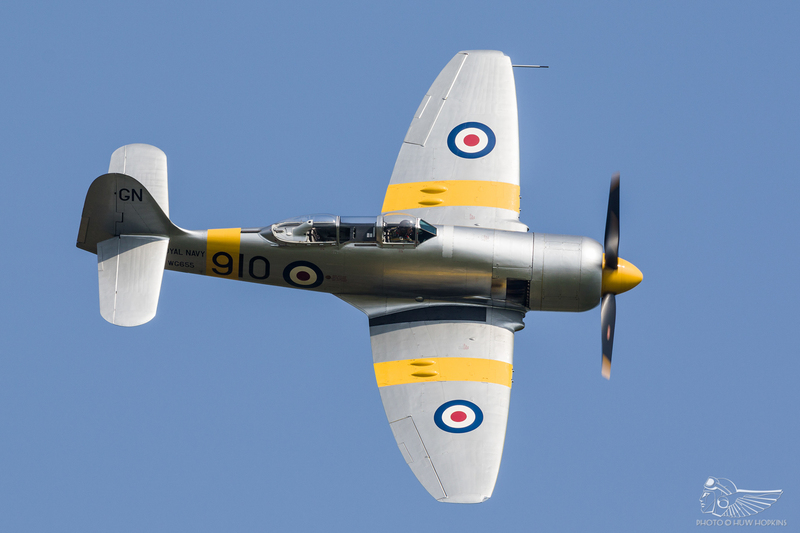 Moreover, given the Thunderbolt’s well documented wartime operation with the US 8th and 9th Army Air Forces, it is an aircraft with great historical significance to the UK and the historic scene has been left lacking in its absence. 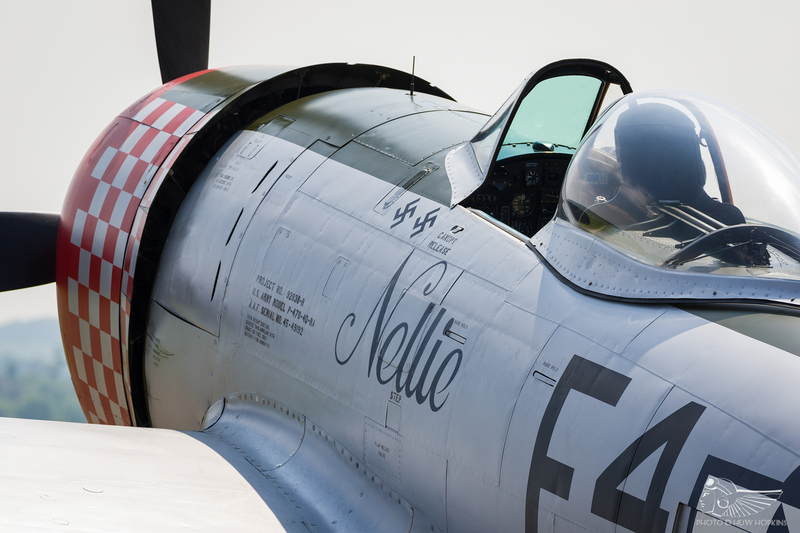 Adorned in a new paint scheme as a 495th FS machine Nellie, the Thunderbolt took the opening slot of the flying display on both days. 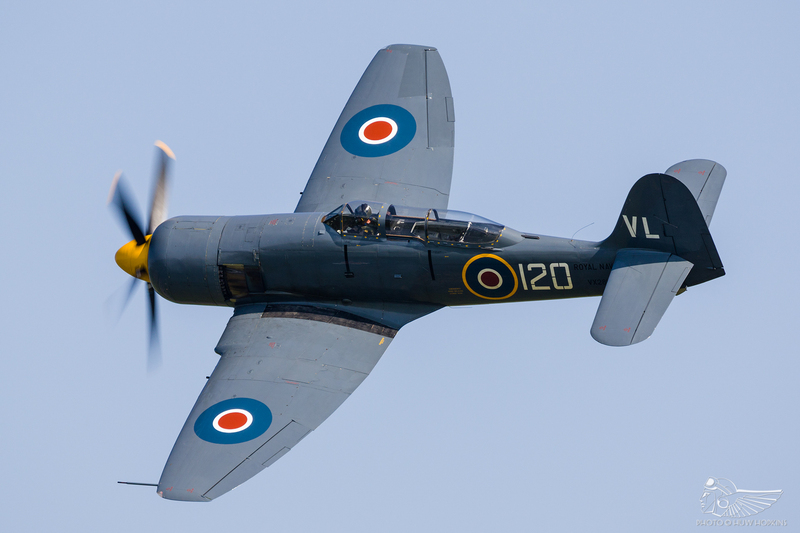 The Jug had displayed the weekend prior at the inaugural Ragley Hall airshow, however the Air Festival marked the first major airshow it had displayed at since its arrival from the US. The large fighter was displayed by Stu Goldspink, with an impressive protracted routine on the Sunday. 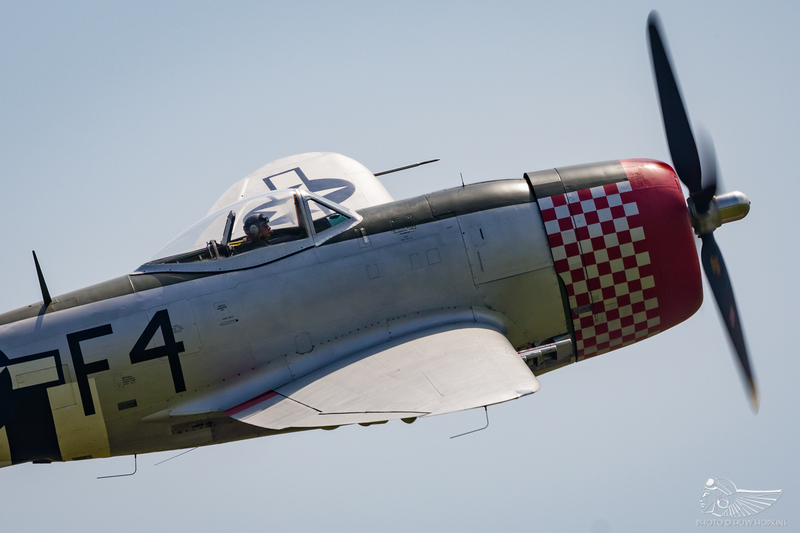 Commentator Ben Dunnell played some archive audio of wartime P-47 pilots to contextualise the relationship between the Thunderbolt and the UK, before twinning the lyrical aerobatics and smooth sound of the Thunderbolt’s purring radial with Band of Brothers Suite Two from Michael Kamen’s soundtrack to the 2001 HBO series – a superb choice. 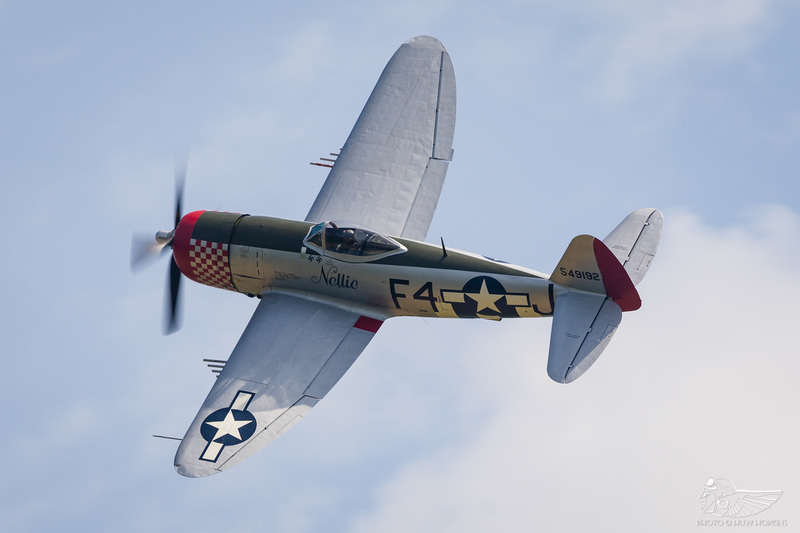 Contrary to its size, the P-47 is relatively quiet compared to most Second World War fighters and accordingly lacks some of the presence that a Merlin-powered type or gnarly Navy machine offers. This made for a fairly flat opening to the flying programme; though logical to start the display with a star item, it may have been better suited to a slot later in the programme, possibly back to back with Sally B – a missed opportunity, perhaps. 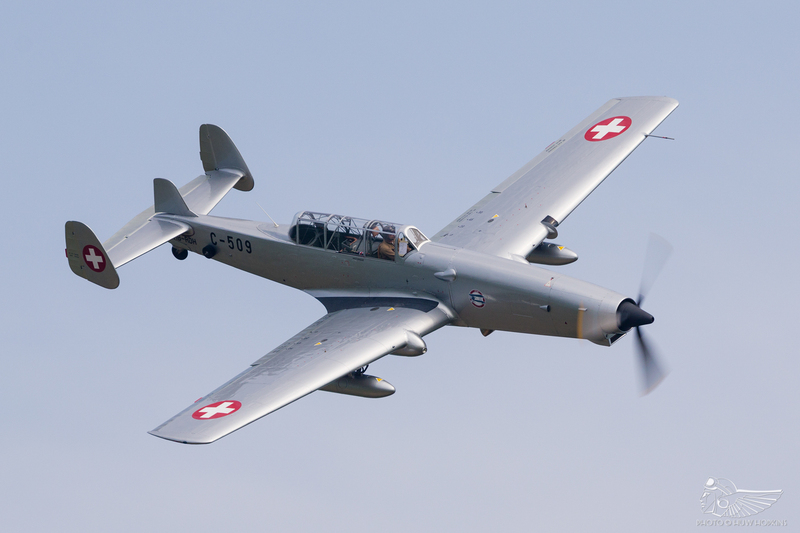 Another real coup for the show came with a type not seen at a British airshow for quite a number of years – the Farner Werke C-3605 Schlepp. 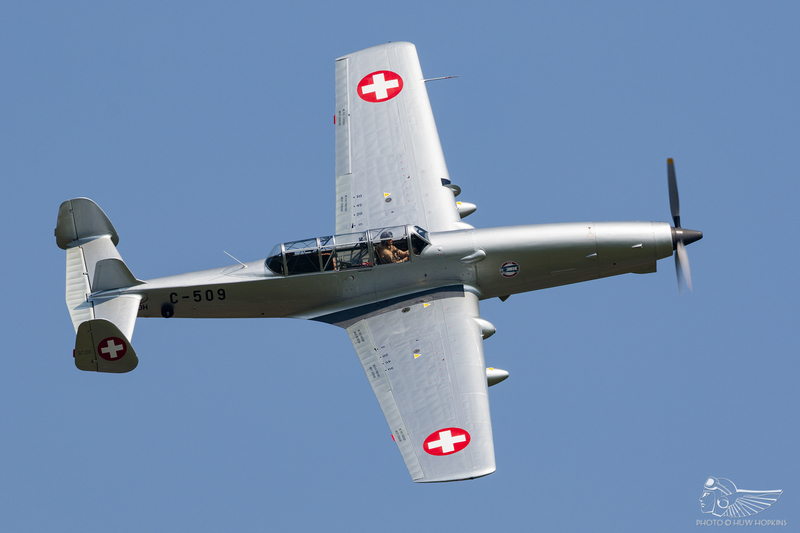 This post-war target tug conversion of the EKW C-3603 saw the aircraft’s nose lengthened and V12 power plant replaced with a turbo-prop engine. 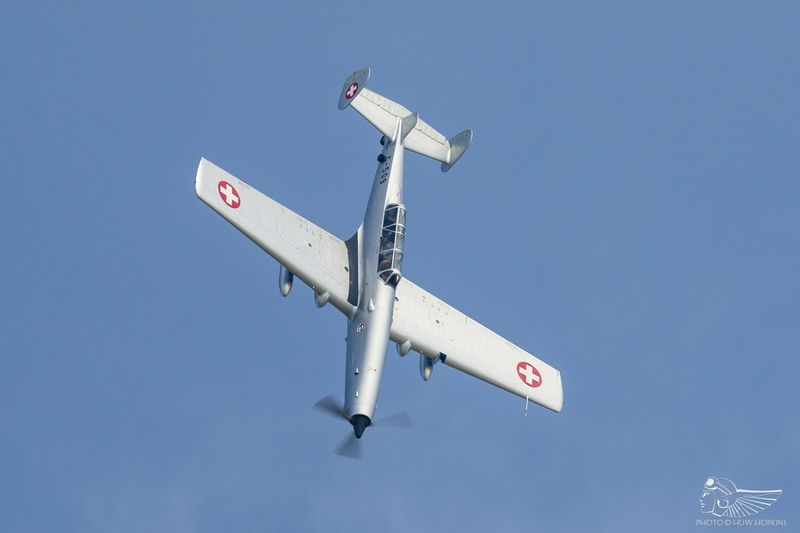 The Schlepp made the long journey from its base in Sion, Switzerland where it is operated by 46 Aviation, the outfit run by Swiss aerobatic maestro Emiliano del Buono. What the Schlepp lacks in good looks it certainly makes up for with agility, as Emiliano ably demonstrated. From take-off, the Schlepp entered into a series of impressive wingovers and vertical aerobatics, including a bunting recovery from a half Cuban and a precise four point roll. The small turning radius kept the aircraft in front of the crowd and made for a very engaging display, one which I hope we see in the UK again soon. Public favourites were interspersed throughout the show. 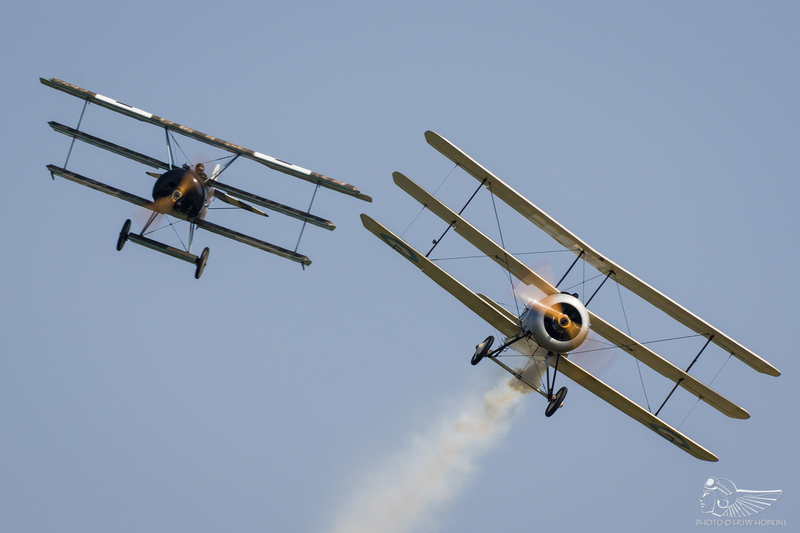 The Aerosuperbatics Wingwalkers and the Great War Display Team appeared at the first Air Festival in 2017, the latter returning with their Avro 504K replica, and were joined by the Tiger 9 team – all three acts are always a delight to watch and went down well here with the broader audience. 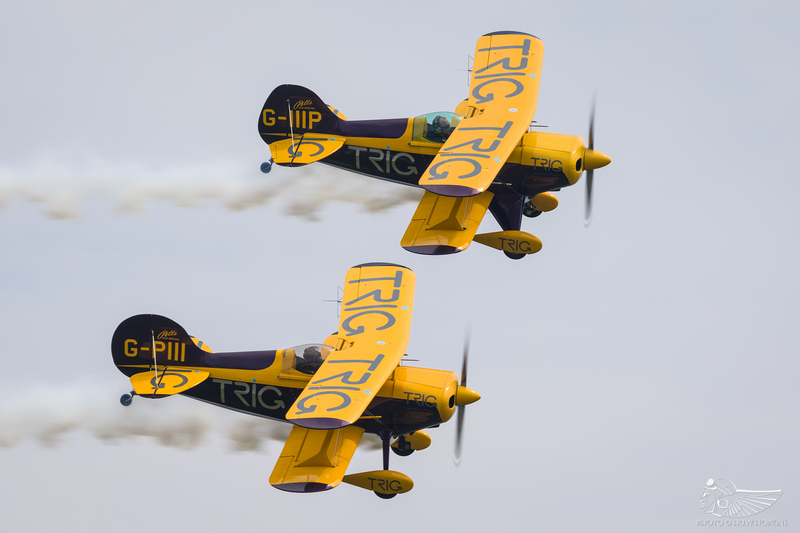 British-based aerobatic acts featured some of the best on offer too with the TRIG Team’s pair of Pitts Specials and the Global Stars. French military participation headlined the show, with appearances by the stunning aerobatics of the Équipe de Voltige de l’Armée de l’Air Extra 330SC, the punchy Rafale solo display and, on Sunday, the Patrouille de France benefitted from the lifting of airspace restrictions from the Stansted and Luton zones to wow the crowd with their full routine. Sole RAF participation came from the Chinook demo, sadly a shadow of its former self in this RAF100 year. 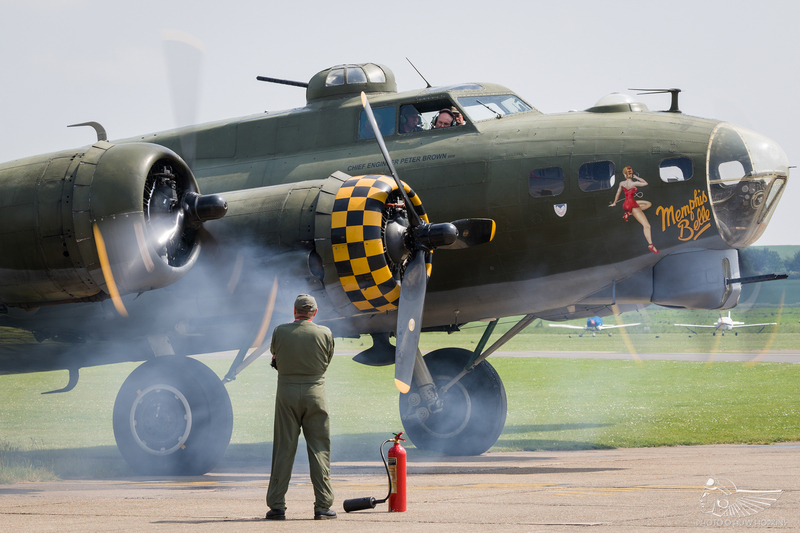 This year’s Air Festival included more trainers and lighter vintage types, the likes of which were sorely lacking at the inaugural edition. 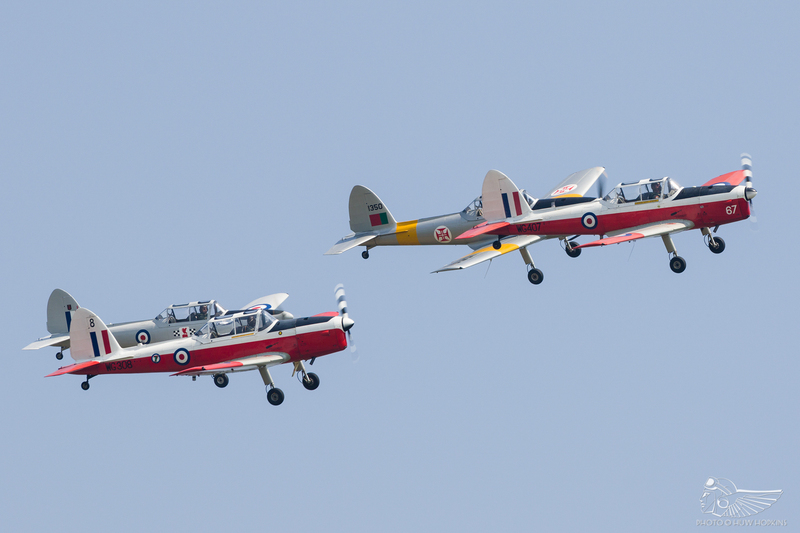 New to the UK circuit are the Four Chips, flying a quartet of de Havilland Chipmunks. 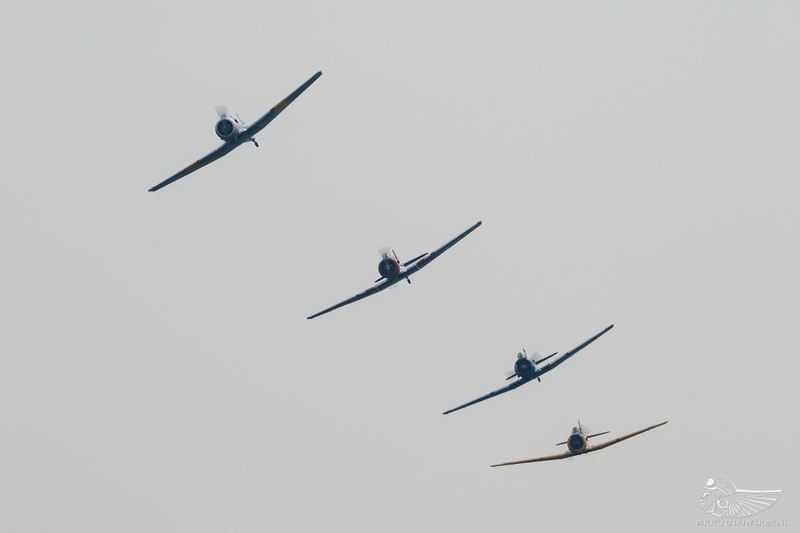 With Howard Cook leading David Petters, Paul Brown and Jon Higgins, the four Chipmunks were presented in various formations in what was the team’s public debut. It was nice to see the oft overlooked Chippie being given a more prominent billing. 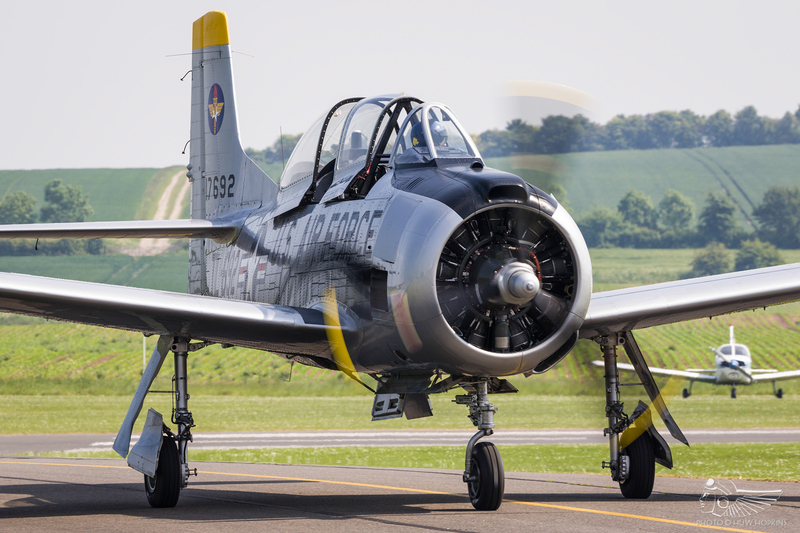 Impressively, the IWM gathered eight North American T-6 Texans/Harvards to mark the 80th anniversary of the aircraft’s first flight, including some of the more elusive privately owned examples of the type. After some ear bashing formation take-offs the T-6s split into three sections for a multi-axis display. Choreographer of the routine Cliff Spink led a section of four Harvards over the southern display line, varying formations from box four to line astern. Meanwhile, the IWM’s display co-ordinator Rod Dean led a trio tail chase over the line closest to the crowd. 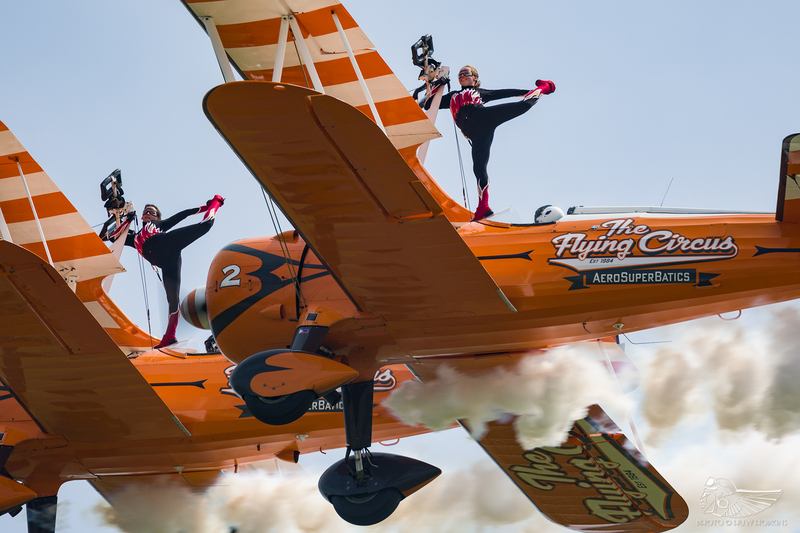 Above all this Anna Walker provided solo aerobatics in TFC’s example. I have often wondered what a multiple Harvard sequence might look like at Flying Legends and based on this layered, dynamic sequence, it would fit in very well indeed. 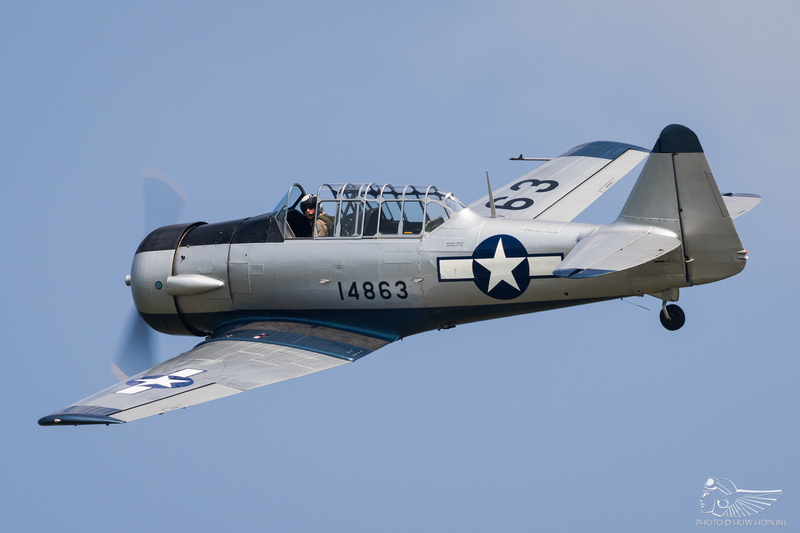 Commentator Ben Dunnell managed to persuade display pilot Stu Goldspink to join him in the commentary box for a brief but informative discussion of the flying characteristics of the T-6, lending some context to the whole routine and the type’s historical significance as an Allied trainer. 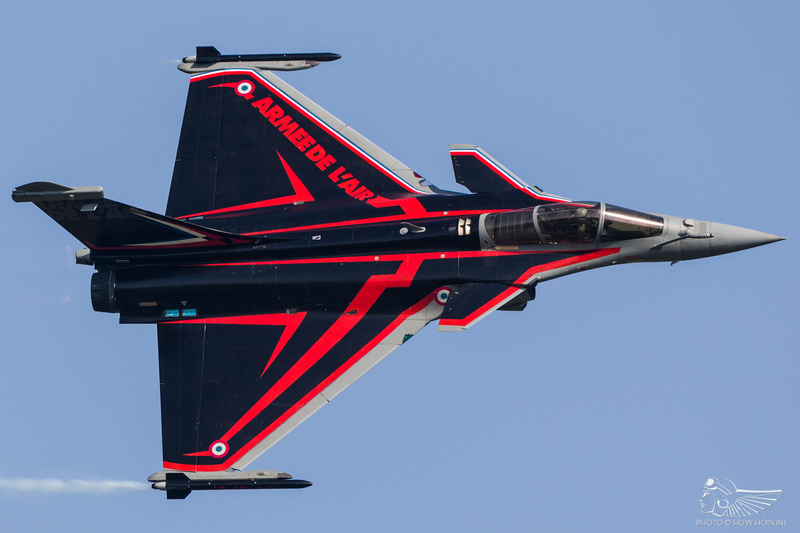 The successor to the venerable T-6 was also on show with a typically energetic aerobatic display of the Groupe Fennec T-28 Trojan in the hands of the irrepressible Dave Southwood. Unfortunately a technical issue curtailed the Trojan’s Sunday display after just a few passes. Heavy American hardware also appeared in the form of B-17 Flying Fortress Sally B, Aces High’s C-47 Skytrain and Plane Sailing’s Catalina. Alongside the Catalina, a fair number of the warbirds displayed over the weekend were naval types, giving a nice through line to the flying programme. 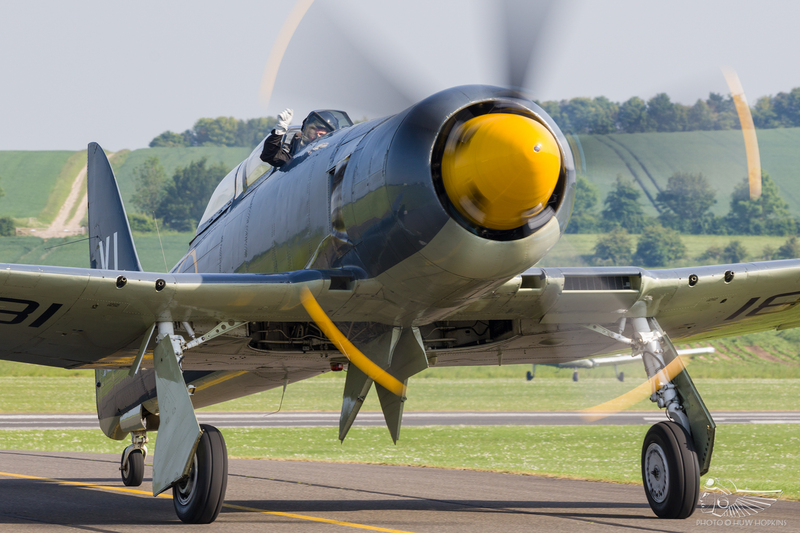 Paired for the first time were Anglia Aircraft Restorations’ Hawker Fury ISS and TFC’s Sea Fury T.20, with Richard Grace leading Brian Smith through a series of sweeping vertical figures. It is interesting to note the different power plants mated to these Furies, with the Bristol Centaurus and P&W R-2800 offering contrasting engine notes. Their display slot on the Sunday was considerably longer too, allowing them to do much more in the way of formation aerobatics. Similarly, TFC’s Corsair was put through a very precise protracted routine by Alan Wade. 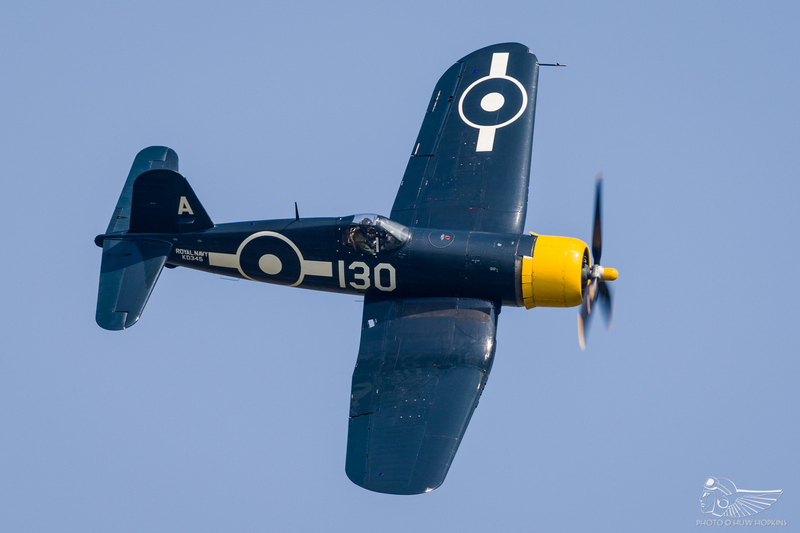 The third Hawker Fury variant to fly at the show was the Royal Navy Historic Flight’s Sea Fury T.20 in the hands of Chris Gotke. 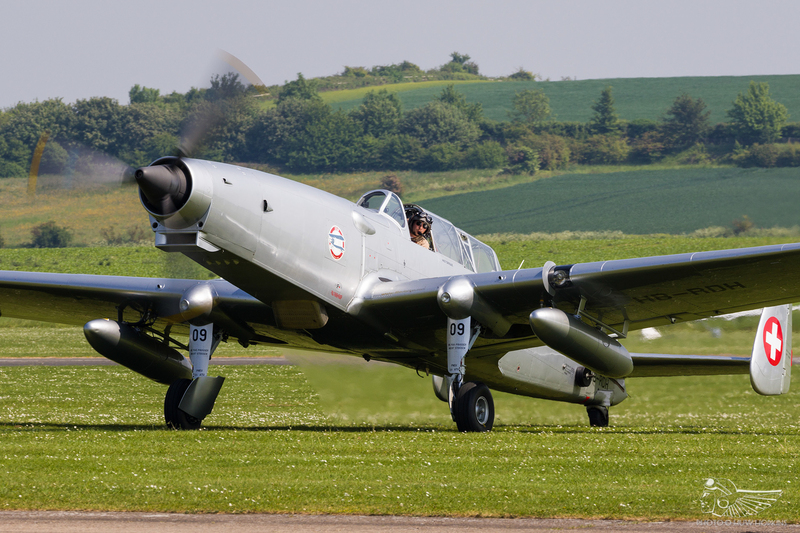 This was my first time seeing the Fury since its return to the circuit following lengthy repairs necessitated by the forced landing experienced at Culdrose in 2014, for which Gotke was awarded the Air Force Cross for his airmanship. My word, it is good to see him back with his favoured steed performing his typically lyrical displays with gusto. At the more sedate end of the naval aviation spectrum, the RNHF also presented one of their Fairey Swordfish. 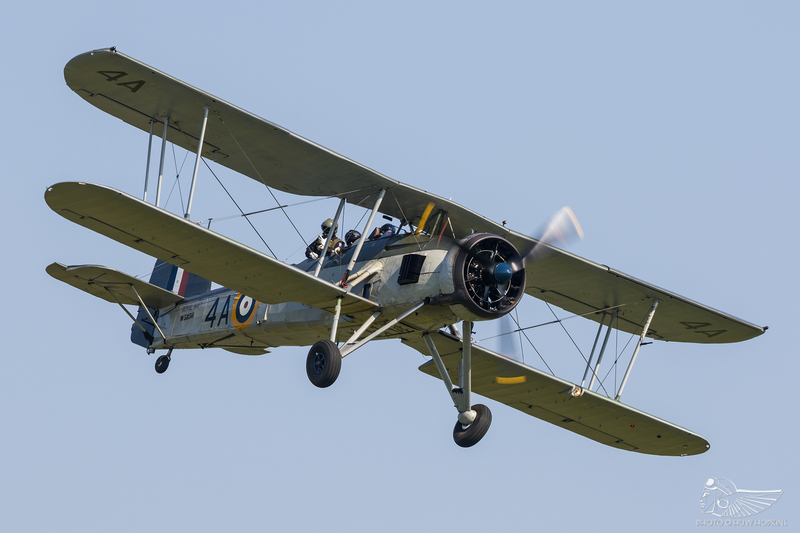 It’s an aircraft we mustn’t take for granted given the numerous engine troubles the RNHF experienced over the years with their two Swordfish. Although difficult to display such a large and sluggish type at a fairly large venue, the crew put on a very tidy show indeed in the early evening sunlight. 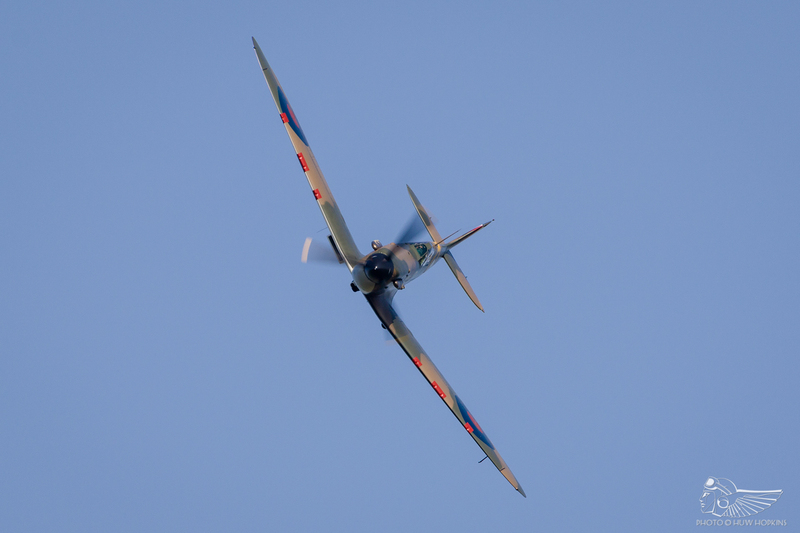 What better way to close a Duxford flying display than with a solo Spitfire? One of the highlights of the weekend came courtesy of John Romain piloting the IWM’s Spitfire Mk.I N3200 in a sublime aerobatic routine that illustrated perfectly the art of display flying. Overall, the show was punctuated by some very nice displays and interesting items. 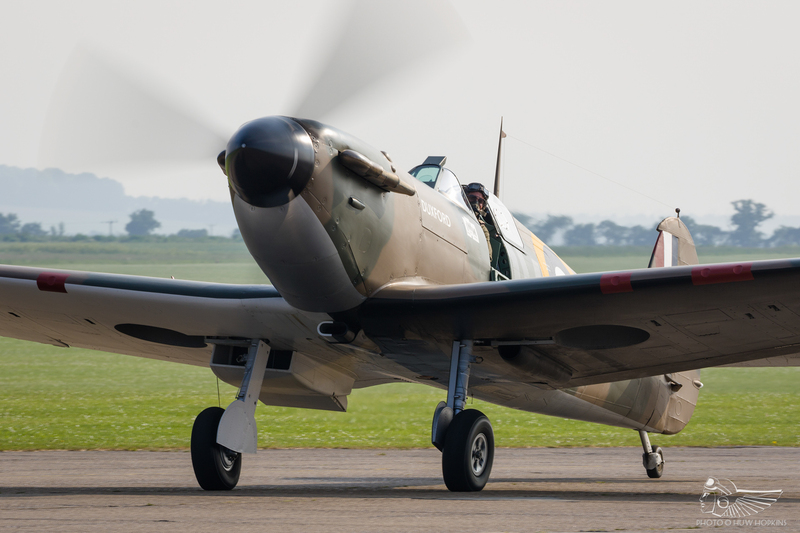 Fewer of the locally based historic aircraft operators were overlooked this year which added depth to the flying programme, and these aircraft were complemented by a solid raft of contrasting military, civilian, modern and historic types. However as a whole the event proceeded at a very sedate pace, which unfortunately took the wind out of its sails and left the whole programme feeling rather flat. Beginning the flying display an hour earlier at 1300 certainly didn’t help matters. With September’s Battle of Britain airshow once more set to be a bumper event heavy on the warbird and vintage content, perhaps this ‘diet Duxford’ in May is the acceptable trade off for such a comprehensive autumn event, albeit one the hardened enthusiast is more likely to overlook. 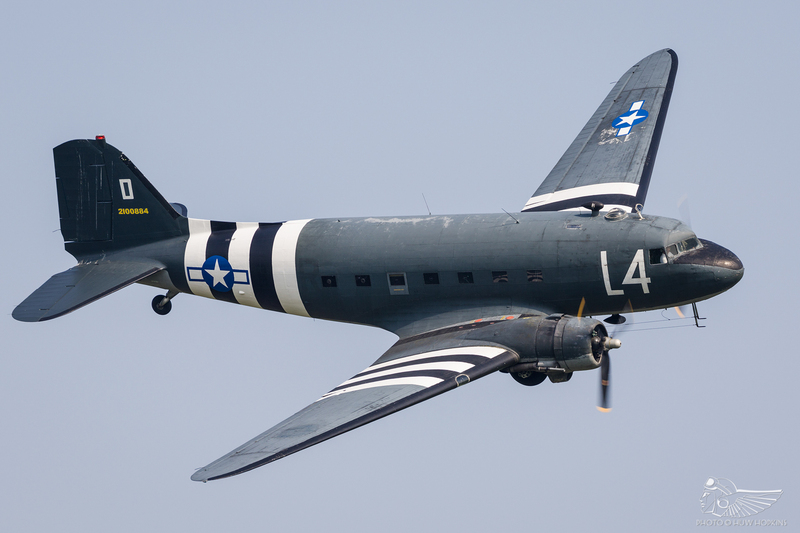 The airshow seemed to be well attended and well received by the noticeably more general, family-based audience – with that in mind, one hopes that the Air Festival is a commercial success for Duxford despite its diminished appeal to the smaller aviation enthusiast community.